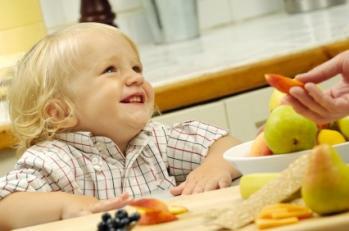 Menu suggestions for toddlers can help you meet the challenge of feeding your picky eater. With a variety of foods on hand, it's easier to find foods that your toddler will eat. If you haven't already realized it, your toddler's eating habits can change from one month to the next. Some of this may have to do with how quickly he is growing. During growth spurts, his body uses more energy and he'll have a larger appetite. However, while your toddler grew in leaps and bounds the first year of his life, his development has probably slowed down, and he simply doesn't need as much to eat. While you should spend some time creating a healthy diet for your child, menu suggestions for toddlers should begin with a few "don'ts" as well. Don't allow her to fill up on liquids. Obviously, milk is important in your child's diet, but don't give her more than 16 to 24 ounces per day. You should also watch her juice intake, limiting it to no more than one cup per day as well. Don't give her snacks before her meals. This is common sense, of course, but some parents give in to their children's hunger pangs and allow them to nibble on snack food too closely before the main meal. Don't have unrealistic expectations. Remember, your toddler is a little person who doesn't need to be served a plate full of food. Keep portion sizes small and manageable. Don't play the "war of wills" game with your child. If you try to force him to eat, you'll both end up losing. If he refuses to eat, don't force the issue, but make it plain that he can't fill up on snacks later. Also, remember that he has definitive taste buds just like you, and there will be foods that he just doesn't like. Keep in mind that toddler serving sizes will be about 1/4 of an adult serving size. The following menu suggestions for toddlers can be modified to meet your toddler's likes and needs. Remember, the above menus and portion sizes are just suggestions. Your child may feel less hungry as the day progresses, so don't force her to finish each portion that you serve. Obviously, if your child has any food allergies, modify the menu accordingly.